MSRP- $1,995.00 (4/4) – Representative image. Each individually made. 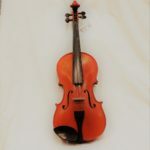 Intermediate level handcrafted viola with pernambuco bow and oblong case. 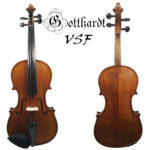 Student level handcrafted cello with Brazil wood bow and hard case. Intermediate level handcrafted cello with pernambuco bow and hard case. Intermediate level solid wood handcrafted bass with pernambuco bow and hard case.